Horst Wein is known as “the coach of coaches” having mentored and influenced over 11,000 soccer coaches in 54 countries all around the world during the last 25 years. He is the creator of the internationally renowned YOUTH FOOTBALL DEVELOPMENT MODEL – the first ever, age-appropriate, progressive programme of training for youth footballers. One of his football books, “Developing Youth Football Players,” is the official textbook of The Spanish Football Federation and The Football Federation of Australia, and has sold over 100,000 copies worldwide, to date. Horst has majored in the ground-breaking concept of Game Intelligence, since 2002, having written and lectured extensively on the topic in four continents. Wein is one of the deepest and most influential thinkers within the game. He was one of the first to strongly argue in favour of smaller-sided games (although he prefers the term ‘simplified games’) for younger players; views that everyone now seems to be accepting and enthusing about but which were considered as idiotic for a long time.. The game is the teacher! Horst Wein (HW), a German university lecturer with coaching assignments in 51 countries, has always been convinced that one way of promoting the game of football and persuading more youngsters to take up the sport is, to make the practise of football more enjoyable, attractive and from the learning point of view more effective! NCFA’s Paul Cooper (PC) talks to the man that operates on the cusp of football’s ever dividing legions. Q) Your book Developing Youth Soccer Players was a revelation in both grassroots and the professional game, what was your inspiration for writing the book? A)In most parts of the world, as still happens today in the majority of FIFA, member countries, young children are exposed to the adult game what obstructs their natural development. My idea was introducing and diffusing in the late 70’s age-orientated football competitions and training methods to help young people to unlock and develop their full potential to the most introducing them first to 3vs3 on 4 goals , then with 10 years to 5-a-side football , from 11 and 12 years to 7-a-side football and finally for one year with 13 years of age to 8-a-side football in between the penalty areas of the full pitch on 7-a-side football goals placed on thee 16.50m. Once a proved it with tremendous success in field hockey, I applied the same philosophy for football. 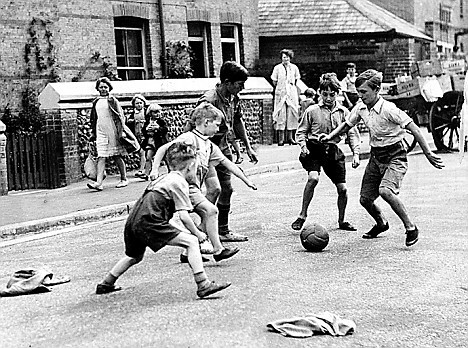 Q) How much do we miss street football, the breeding ground for so many talented players in the past? A)FUNino is considered the renaissance of street football. It’s even more attractive and effective from the learning point of view than street football. Today the kids are lacking the ability to create their own games and mainly play more or less the same game without any variation. FUNino played on 4 goals allows young football player to receive much more stimuli than in the traditional street football, considering that there are 26 different games which have another 30 different variations. Q) In your view was Rinus Michels correct when he said that the best coaches take the core values of street football as their coaching philosophy for children. A) I agree with Rinus Michel who asked the best youth coaches to rely on the values of street football in which the game has been the teacher and not the coach. The coach only guides the young player and help the kids to discover the real magic of the game through questioning from time to time to make them aware of things they have not been aware without him. Q) The Spanish FA have used your book as their coaching manual for children, have other FA’s followed suit? Q) Children have very little say when it comes to organised football – is this a problem for their social and football development? Q) You champion a 3v3 format for children’s football – what are the benefits over other formats such as 4v4, 5v5 and 7v7? A) *The two wide goals at each end encourage young players to use the wings in attack and open up the play. *Playing with 2 goals stimulates greater reading and understanding of the game, including peripheral vision, perception and decision making skills before executing any actions. *Stimulates, more than any other traditional football game, intelligence, perception, imagination and creativity. *Sufficient space and time allows children to read the game and play constructive football and to develop basic communication skills. *More time and space, better reading of the game and better decision-making and skill execution means less mistakes. *Due to the fact that the same basic game situations appear again and again (i.e. the 2v1 situation) the young players learn very quickly. *In FUNino, 8 and 9 year olds enjoy more touches on the ball, treating it as their best friend. No long clearances or wild and dangerous kicks can be seen in which players “violate the ball”. *Players attack and defend in a triangular formation for better communication and collaboration. Positioning in the field is easy. *Allows an allround development of all participants as there are no fixed positions in a team which would avoid too early specialization. Everybody has to attack as well as to defend, using the whole pitch. *Usually there are lots of goals and goalmouth action. *Each player scores more than one goal per game. *All the players get to experience a starring role in this dynamic game. *All 3 players, including the weaker ones, play a critical role in this game and are involved mentally and physically throughout the game. Nobody can hide! Q) At what age do you think children should be playing the full 11v11 game? A) Only after having enjoyed playing competitions up to their mental and physical capacities like Funino, 5-a-side,7-a-side and 8-a-side Football young players can be approached to the difficulty and complexity of the full side football game. At his stage they have the communication and cooperation skills together with the technical ability and the football knowledge to play the 11 versus 11. Q) In your experience how territorial is the professional football fraternity when sharing children’s best coaching practice? Q) All children get to enjoy the game of football as children (and not as mini-adults) as the game(s) are tailored to their needs. 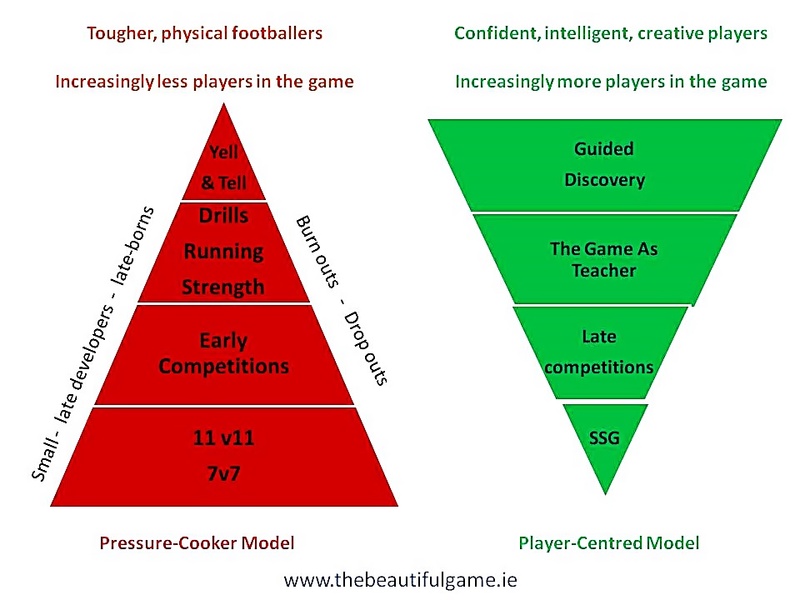 A) Children have the opportunity to reach their full potential, whatever that is, through an optimal development model, including a player-centred approach, that is games-oriented (rather than drills) and a guided discovery coaching style (rather than the traditional instruction style). As the model is more inclusive and fair than the traditional elitist model, there are many social and character/lifestyle benefits emanating from this approach. Last spring I first came across the name of Horst Wein. The Arsenal manager, Arsene Wenger, had advocated Wein’s teaching development methods for younger players during an interview in 4-4-2 magazine. At the time, I was looking for a new approach to coach younger players at the 1v1 Soccer academy. I had left the provincial program (coaching at the U14/15 level) and wanted to ensure that the development methodology that we used would be successful to develop skilled and intelligent soccer players at the younger age levels. I was therefore delighted to learn on the Canada Kicks website that Horst Wein would be coming to Canada. Bill Ault has done a great job in launching a new coaching website which will include regular articles from Horst. Therefore, I will not do Horst’s methodology any injustice by trying to articulate his development model within this one short article. However, I will say that we, the coaching community in Canada, need to embrace new ideas and give serious thoughts to how we are currently developing our young players. Time and time again we hear examples of our international players lacking technique, tactical knowledge, speed, strength and the necessary desire. We need to address this situation and provide kids with progressive development training programs that will motivate them to learn and increase their enjoyment of the game. As a parent of a seven year old player, what strikes me most about our current programs is that we are teaching young players “an adult game”. Why else, do we put young players on large fields where they have limited touches and are unable to kick the ball far enough to reach distant teammates? What I liked most about Horst’s methods was that they are built around the kids and how they naturally learn. In fact, he utilizes many proven techniques used to teach kids school subjects such as mathematics and languages. In Horst’s development model the difficulty and complexity of the simplified small-sided game activities are increased to match the natural physical and intellectual development of the players. Kids thrive on competition and on playing tag games (it is what they do) and we know that they have the inability to concentrate for long periods at once. They get bored from time to time! So why not provide them with variety (something new every 15 minutes) and incorporate competitions and multi-lateral games (tag games) into their training to improve co-ordination? Not necessary new ideas at the youth level. However, what separates Horst’s model from others is the different roles of the coach and the players. Bridges between learning a subject and correctly applying it. Training and competition considered as one unit. Training and competition often not linked. Players are central to the learning environment. Uses questioning to prompt players. Understands and allows kids to take breaks and come back to soccer learning when they are refreshed (play on swings or go swimming). Central and main participant in learning process. Receive, processes and gives information to coach and fellow players. Have we ever given the players the responsibility to set up their own drill stations to teach leadership and responsibility? Have we ever been content to stand back and let the players teach themselves and “coach” each other? These are not techniques that I have seen consistently applied within a progressive development model spanning ages 7 -15. However, after watching the response by 10 year olds over 1 ½ days, I can confirm that they work. Players were led through a series of activities that provided them with a steady progression from 3v3 game situations to a 7v7 game. The most impressive thing from my perspective was seeing the players put into practice, during the 7v7 game, what they had learned in the smaller game activities. They built attacks from defense, through the midfield and to the forwards by retaining possession, communicating and creating space for themselves. It was a pleasure to watch the players be so confident and enjoying the game. Perhaps we need to stand back, let our players play and let them use their natural intelligence and enthusiasm to “discover” the best way to play. In summary, the Horst Wein weekend was a time to ponder and ask why we have players before the age of 14 playing competitive 11v11 soccer on full-fields. Are we catering to the needs of our youth or to the demands of parents and the sport’s administrators? Even if young players want to play 11v11 at an early age, then why are we letting them? We seem to lack a common vision and a clear understanding of the strengths and weaknesses of the current Canadian players. What are the common development problems that all our young players are facing and what are we doing to address these? Many of the provinces, academies and clubs are addressing some or several of these issues – but only in isolation. We need a common strategy and action plan so that we can all make progress as a nation. It is generally understood that successful player development programs require at least 10 years before success can be clearly demonstrated. Therefore, we should start now and if we do not have our own model, perhaps we adopt Horst Wein’s? It is one that many of the top clubs and federations in the world are currently adopting. Can we afford not too? Horst Wein will hopefully be back in Canada next April. Go see his teaching methods for yourself, you will not be disappointed!